For the past two years a conglomerate of trade associations, industry, government and academia have been collaborating on the world’s first operational 3D printed excavator. Five student engineers from the University of Illinois at Urbana-Champaign entered and won the design competition. Known affectionately as Project AME (Additive Manufactured Excavator), the excavator is being 3D printed using various machines at the Oak Ridge National Laboratory’s Manufacturing Demonstration Facility (MDF) to create and assemble three components: the cab, the boom, and a heat exchanger. The excavator’s boom will be fabricated using newly developed free-form additive manufacturing technique to print large-scale metal components. 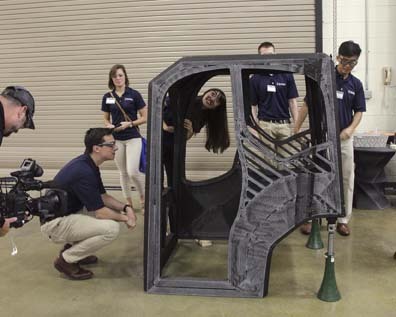 The UIUC student engineering team was on hand at the MDF to watch their Project AME cab design take shape on the big area additive manufacturing machine –using carbon fiber-reinforced acrylonitrile butadiene styrene, or ABS, plastic. Their reaction could only be described as pure joy. The excavator is a collaboration between the Association of Equipment Manufacturers (AEM), National Fluid Power Association (NFPA), Center for Compact and Efficient Fluid Power (CCEFP), Oak Ridge National Laboratory (ORNL) and the National Science Foundation (NSF). This project was supported by DOE’s Office of Energy Efficiency and Renewable Energy – Advanced Manufacturing Office. CCEFP academic partners – Georgia Tech (GT), University of Illinois, Urbana-Champaign (UIUC), and University of Minnesota (UMN) – are leading the research activities for Project AME. A GT research team is designing the additively-manufactured steel boom, stick and bucket. A UMN research team is responsible for the aluminum-powder bed 3D-printed oil cooler design. The Oak Ridge National Laboratory (ORNL) is developing all processes required to 3D-print these excavator components. Watch footage of the visit and interviews here. Project AME will be on display at IFPE and CONEXPO-CON/AGG 2017 as part of the new Tech Experience.